There are more than thirty towns in the Russian Arctic and subarctic which are home to 3.5 million people. These are not small settlements but industrial centres which mine and process metals, coal, and hydrocarbons (Figure 21.8). Fig. 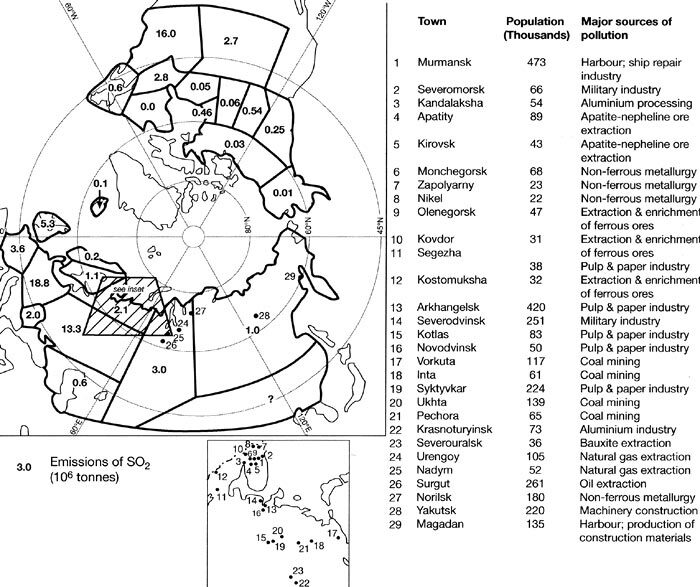 21.8 Air pollution in the Arctic: regional emissions of sulphur dioxide and main industrial towns. It is well known that industrial development of the Arctic region requires massive investments and only large industrial projects pay off. These are bound to damage the environment. In the north, this precondition is further exacerbated by public attitudes: many northern towns are not permanent places of residency for their dwellers, who migrate there for a few years in pursuit of higher wages, while the public in general is not aware of pollution violations because of their remoteness. During the Soviet period, the lack of information was further strengthened by official secret!veness as access to many of the northern towns, which were accommodating military-related industries, was restricted. Perhaps the most striking case of industrial air pollution in the Arctic is that of Norilsk, the world's northernmost town, generating more emissions than any other city in the FSU. The source of pollution is the Norilsk Metallurgical Combine. Developed in the late 1930s, the Combine processes copper-nickel sulphide ores to produce copper, nickel, and metals of the platinum group. It is a giant complex of mines, enrichment plants, smelters, refineries, and support services located in Norilsk and its satellite town of Talnakh. The bulk of air pollution in the form of SO2 (Figure 21.5) is generated during smelting when copper is separated from sulphur, iron, and other impurities in the ore. The Norilsk-Talnakh ores, which are also exported for processing in the smelters of the Kola peninsula where local resources have been depleted, have a high sulphur content. Sulphur is not recovered by most facilities at Norilsk (although it is recovered at the Kola smelters) and in 1988, the amount of SO2 produced by the Combine constituted about two-thirds of the SO2 emissions generated by the whole of the United Kingdom (Shahgedanova and Burt, 1994). While pollution levels were a way above those typical of the late Soviet period, attempts at pollution abatement and technological renovation of the older facilities in order to reduce pollution have always been few and hampered by the lack of investment capital. Any reduction in the production of metals was inconceivable because of their military-industrial use and strategic importance. The Combine is now owned privately by the Norilsk Nickel Joint-Stock Company (NNJSC) but has the attitude to pollution abatement changed? All towns accommodating industrial facilities owned by NNJSC (e.g., the Kola smelters) are notorious for severe air pollution. 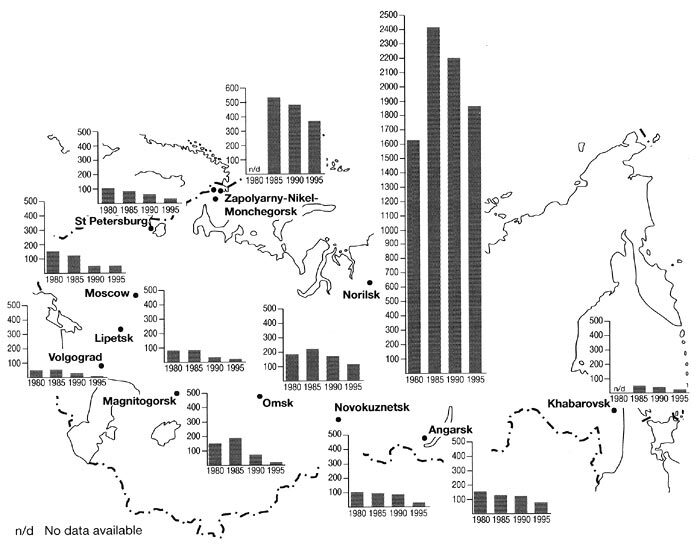 The economic slump affected non-ferrous metallurgy less than other industries (Schroeder, 1998) and should a general decline in production continue, the importance of these centres (especially Norilsk) to Russian and world markets will ensure high production levels. Emissions, which might be reduced in comparison to the peak years, will remain high unless modernization programmes are implemented. At present, the failure to extract sulphur, a valuable raw material, is seen by NNJSC as an economic loss and programmes are developed to increase economic efficiency of metal processing with additional benefit of reducing air pollution (Bond, 1996). New emission controls are being introduced in the Kola smelters. However, these improvements are financed by the Scandinavian countries which have sustained severe environmental damage as a result of transborder pollution. Norilsk does not have this 'locational advantage' while financing from the federal budget remains as problematic as ever. Producing 20 per cent of the world's nickel and 40 per cent of the platinum-group metals, NNJSC appears to be ideally placed to invest in environmental protection. However, escalating production costs brought about by rapidly rising costs of energy supplies and provisioning the remote Norilsk region via shipments over the Northern Sea Route have created numerous economic pressures and improvements in pollution abatement may have to wait yet again. These problems typify the position of industries in the north. There is vast evidence for the adverse health and ecological effects of air pollution in Norilsk. Thus, the incidence of respiratory and neurological diseases in infants, which are characteristic of polluted cities, is twice as high as in the Arctic towns with cleaner air (Revich, 1995). High pollution loads have caused severe damage to health and productivity of vegetation and affected its structure and composition. The Norilsk region is located in the forest-tundra and tundra biomes but the sheltering effect of the Putorana plateau provides the unique conditions for the development of the world's northernmost open stands of larch. Growing in a severe climate and on permafrost, even under pristine conditions such forests are weakened by natural stress and the absence of the above ground competition and are particularly susceptible to damage from contamination. An area of 400 000 km2 is affected by acid precipitation with sulphur deposition exceeding critical loads by a factor of six. Permafrost enhances accumulation of heavy metals in the upper layers of the soil where concentrations of copper, nickel, and cobalt reach 3-4, 1.5-4, and over 0.2 g kg-1, respectively at a distance of 70-100 km from the smelters. More than 5600 km2 of forest and vast areas of tundra and forest-tundra have been damaged. 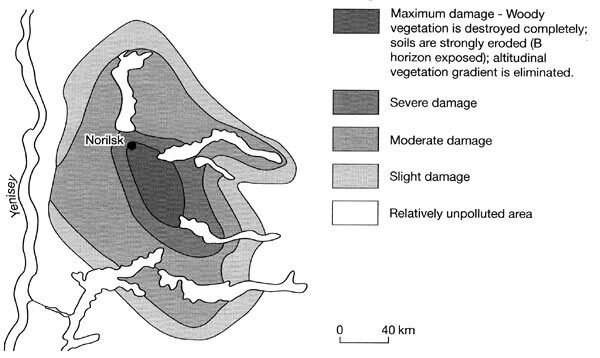 The severity of damage varies depending on topographic and soil conditions (Figure 21.9) but in the vicinity of the smelters so-called 'anthropogenic deserts', characterized by the complete disappearance of plants and development of soil erosion, have developed (Gytarsky et al., 1995; Yablokov et al., 1996). The implications of air pollution in high-latitude cities are literally far-reaching. Contrary to a popular image of crystal clear air, the atmosphere in the remote Arctic regions contains large amount of pollutants including black carbon, sulphates, heavy metals, and organic pollutants which reduce visibility. This has been recognized for quite a long time: in the 1950s, haze layers of unknown origin were discovered during the weather reconnaissance missions flown by the US airforce from Alaska into the high Arctic ('the Ptarmigan flights'). Murray Mitchell, then an airforce officer and later President of the American Meteorological Society, was first to describe this phenomenon which he dubbed 'Arctic haze' (Mitchell, 1956). Since the 1980s, Arctic haze has been linked to the existence of large industrial sources of pollution in the Eurasian north. Many reviews of Arctic haze have been published including those by Raatz (1984), Barrie (1986), Shaw and Khalil (1989), and Shaw (1995). The term 'Arctic haze' is used with regard to anthropogenic pollution that reaches the Arctic although natural phenomena also affect atmospheric turbidity. Arctic haze is comprised of distinct layers of particles that are less than 2 urn in diameter which absorb and scatter light (Figure 21.10a). Fig. 21.10 (a) Typical profile of Arctic haze. Modified from Shaw (1995). Aerosol concentrations undergo strong seasonal variations being 20-40 times higher in winter and spring than in summer. The average composition of aerosols in the winter-spring season is 2 mg m-3 SO2-4, 1 mg m-3 organic compounds, 0,3-0.5 mg m-3 black carbon and a few tenths of a mg m-3 of other substances (Barrie, 1986). Air pollution in the Arctic has important environmental and climatic effects. First, black carbon suspended over snow cover traps solar radiation more efficiently than elsewhere, increasing absorption by more than 30 per cent (Valero et al., 1984) while its deposition decreases albedo by 1-10 per cent (Clarke and Noone, 1985). The result is perturbation of the radiation budget and potential warming of the environment at the regional and, possibly, larger scale. Second, deposition of acid pollutants and, more importantly, pesticides transported from the middle latitudes can damage delicate Arctic ecosystems. Arctic haze occurs because the Arctic atmosphere experiences stagnation in winter due to weak insolation. While depressions penetrating from the middle latitudes are often steered over the Arctic Ocean along the border between sea ice and open water, the atmosphere of continental interiors, dominated by high pressure, is calm and stable (Figure 21.1). Turbulence is suppressed and removal of pollutants by dry deposition is slow. Winter cloudiness and precipitation are small, especially over the high Arctic and north-eastern Russia where the frequency of low clouds in January is only 15-25 per cent (Barrie, 1986). Therefore scavenging of pollutants by snowfall and their removal and transformation by clouds are much lower than in the middle latitudes. Under such conditions, dispersion and removal of pollutants from the atmosphere are more inefficient than in any other region and aerosols can remain airborne for a long time, providing material for long-distance transport. The predominant component of Arctic haze is sulphur in the form of sulphates which account for 30 per cent of haze particles. Chemical fingerprinting and trajectory analysis implicated North Eurasian sources, especially those located in the east, as major contributors (Barrie et al, 1981; Rahn, 1981a, b; Rahn and Lowenthal, 1984; Ottar et al, 1986; Cheng et al, 1993). As Barrie (1986) puts it: 'Nature and man have conspired to make Eurasian sources far more available to the Arctic than those in North America'. First, the Eurasian north is more industrialized: Eurasian emissions of SO2, which can reach the Arctic, are more than twice as high as those from North America, this difference being even higher north of 60° latitude (Figure 21.8). 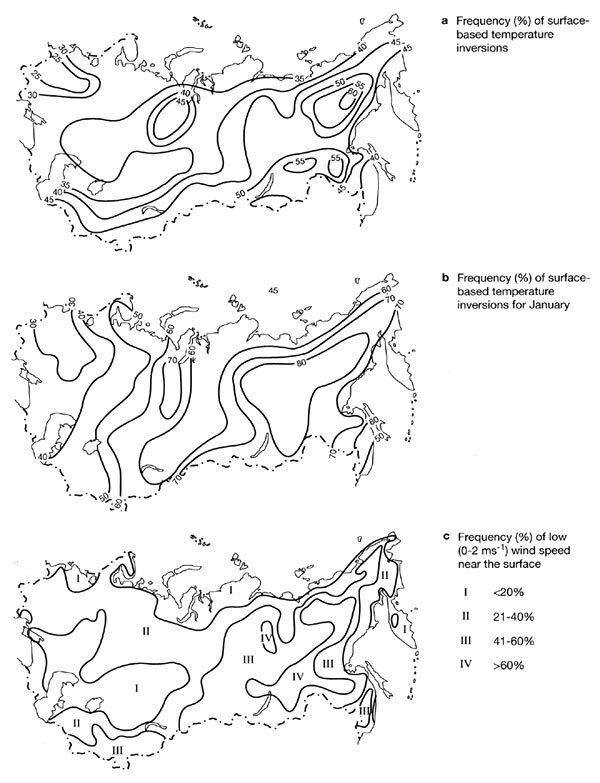 The Norilsk Combine is the main single contributor to Arctic haze (Harris and Kahl, 1994). 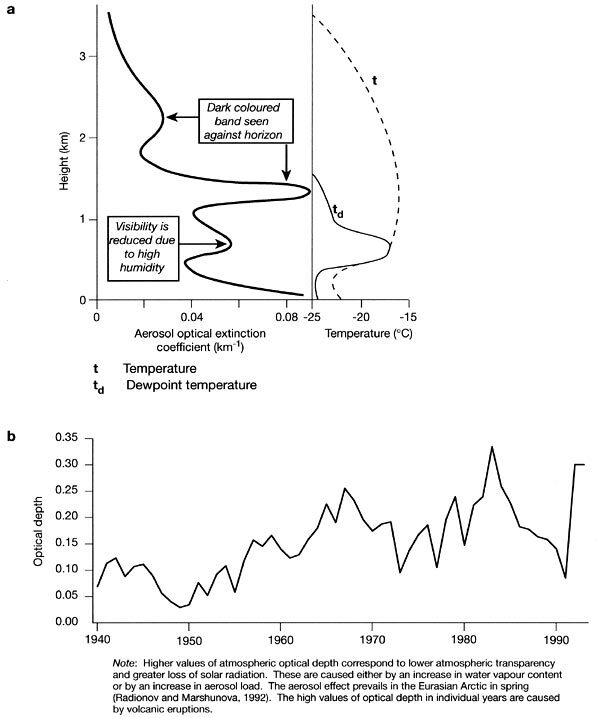 The long-term observations of solar radiation on the island of Diskon (73.5°N; 80.2°E) reveal a significant increase in the loss of solar radiation due to aerosol extinction since the 1950s (Figure 21.10b). The increase in aerosol load can be attributed to the industrial development in the northern regions of Eurasia and particularly in Norilsk. By contrast, in recent years air pollution in the Arctic has decreased in line with the decline of industrial activity in the FSU and sulphur dioxide emissions from power plants in the FSU and Europe. Second, in winter when the Arctic atmosphere is most polluted, the atmospheric circulation favours long-distance transport of aerosols from Eurasia (Rahn, 1981a; Raatz and Shaw, 1984). Pollution, originating from North American sources, travels to the North Pole along depression tracks over the stormy Atlantic and its path to the Arctic is partly blocked by Greenland. By contrast, pollution from Eurasian sources (mainly the FSU but also Central and Western Europe) travels freely along the periphery of the Siberian high (a quasi-permanent atmospheric system in winter) often in the absence of precipitation, clouds, and turbulence along its route. A higher than usual depression activity in the Siberian Arctic has been observed in recent years (Rogers and Mosley-Thompson, 1995). This may be another factor responsible for a decrease in aerosol concentrations in the Arctic atmosphere.